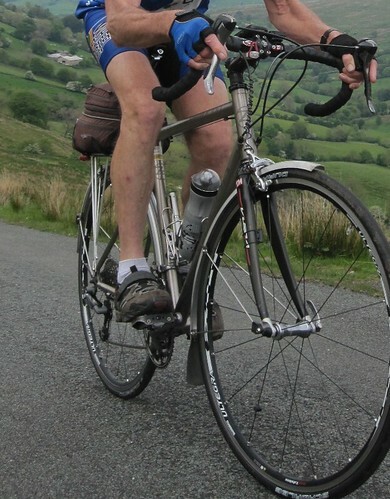 Well I have finally got some pictures of me on the bike with the higher stem. Oddly I thought I was at KOPs but given my fabricated plumbline I am not. This position seems to work better than when I had the seat backward more. I can pedel using higher gears and am generally avoiding the amount of knee ache I had last year. Famous last words and all that the right one does have a bit of a twinge. Riding wise its very uncomfortable on the drops although I am ok on the hoods. Depending on how much I crouch I can obsure the front hub. If I really bend down and flatten my forearms (roughly parallel to the ground) the hub is about a cm in front of the bars. At this position I am much lighter on my hands but have to be really pedalling hard. PS I am in my civvies as I am at work. I can do bigger pics if these are not very clear. When you move the seat back a bit ( 5 - 10 mm ) to get KOPS, eyes will move rearward too. But first check saddle height....slight bend in knee when foot level at bottom of stroke....but if you habitually pedal "toe down" and you can't break the habit, then put the saddle up to compensate. Probably the wrong thing to say, but I think you need a frame maybe 2 sizes bigger than yours, ideally. I'm editing this because its in "too good to lose", and it might just be useful. I have realised that there is a similar topic with a bit more information...http://forum.ctc.org.uk/viewtopic.php?f=5&t=73840...the thread later gets a bit mired, but that's life. Very many cyclists ride "toe down" all the time. Classically, you want your foot level on the downstroke and at the bottom of the stroke, as in the picture below. If you really can't get your foot level, you need to set saddle height for "toe down" at the bottom, which needs a higher saddle than a level foot. If your saddle is too high, you will point your toes and dip your hips just to retain a bit of bend in your knee at the bottom. The right saddle height lets you turn the pedals smoothly even if you push your cadence up very fast....this means no hip rocking, nice and smooth through the bottom of the stroke with a slightly bent knee. Also with the right saddle height, if you want to "force the gear" in other words push harder at slow cadence instead of changing down you will find a bit more power to be had by sliding back in the saddle, this means your leg is a bit straighter at the bottom and you can wring out a bit more push. Some people recommend setting your saddle at this height to begin with.....I don't, because every day isn't your best day, and you are not warmed up when you start a ride....on average you will be smoother with the saddle just that bit lower than at optimum power height, and that goes double off-road when you need to un-weight the saddle but still pedal. Maybe its different if you are riding a short event where you are warmed -up at the start. KOPS is a good start. For touring and day touring KOPS puts me in a position where there is little weight on my hands, so I can freewheel holding my torso up with just one finger on the hoods. This means little strain on hands, wrists, and shoulders.....its worth trying the one finger test after you have set up at KOPS. For more energetic types of riding, pushing hard on the pedals generates an upward reaction to support the torso, and a more forward saddle position can be useful in order to get down low and aerodynamic. Tri bars are not easy to pull up on, so you may want a bit of weight on your arms. Last edited by 531colin on 26 Feb 2015, 8:18am, edited 3 times in total. I thought the frame is too small, but then 2 sizes bigger wouild make the tt too long. I am more of a heel dropper. Will move the saddle back 5mm and see how it helps. Static pictures do not really show a lot. Are your arms that straight when riding? Mine are not. This is of course a personal choice. As an example of static versus dynamic, I recently built a machine with straight bars and parts I had around. Sitting on it in the dining room (where else do you build a bike?) it felt as if the bars were too low putting too much weight on my hands. I did not have parts to swap again so I tried it on the road and in use the position is pretty much perfect for me. samsbike wrote: Depending on how much I crouch I can obscure the front hub. 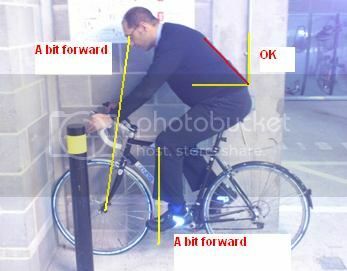 That is why I would say that setting the position according to obscuring the front hub is simply too variable because it depends on your body posture at the time. I too say the frame is too small. Goes with yards of saddle pillar and a very tall stem and a short top tube. 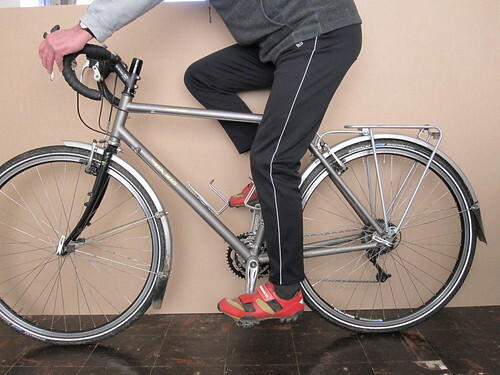 But - I imagine you/we have to work with what you have got which is why the issues about adjusting stem height/length etc to get a comfortable position. As long as you can get the contact points in the right place, size isn't that big a deal...... I was thinking bigger frame, shorter stem, that's a real monster you have there. I was thinking the saddle looks a bit low, but if you drop your heels it will all even itself out. If you put the saddle back, it takes weight off your hands. In what way are you uncomfortable on the drops? Spinning low gears is probably kinder on the knees than pushing big gears.....sore knees also respond to stretching ....have we had this discussion before? I'm not the expert that Colin is, though I do have some experience helping Bikeability students achieve a rideable position on their bikes. The *first* thing I thought when I looked at the picture of you on the bike is, "that frame is far too small for him." I think that you will continue to struggle to find a comfortable position. However, as Colin said, if you can get the contact points in the right places, it may be okay. Putting the saddle up might help with your knees, too. 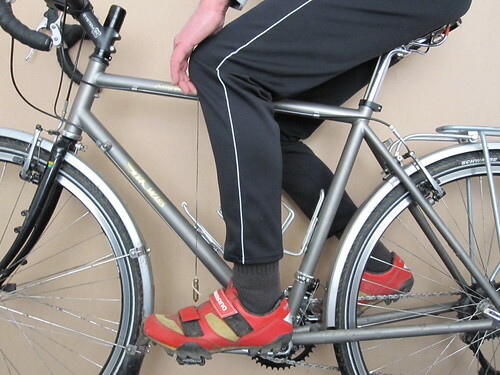 It's possible that raising the saddle will 'correct' the heels down pedalling position? Just be careful that you don't overextend your knees. One of the most common things to upset cyclist's knees is imbalance in the quadriceps muscle group. We never get our knee completely straight when riding, so the Vastus Medialis is under-developed compared to the rest of the quadriceps group (as it only works out when the knee is almost straight). The VM is also the only bit of the muscle group that pulls the knee cap medially, so with an under-developed VM the knee cap is pulled laterally in the groove in the end of the femur, leading to soreness under the top outside bit of the knee cap. This is so frustrating. The bike is a 56cm and I went to 2 shops to get fitted, one apparently a boutique brand. The stem is a monster 110cm, 28 degree rise and its my last attempt to get it right before I admit defeat and either get a new frame or a new fork. I need to see if I am eligble for cycle scheme membership. The thing is most of the frames I have looked at - Genesis, Surly etc all have pretty short headtubes and getting my bars higher is always going to be a struggle so I dont even know what size to get. I have moved the seat back about 5mm and will try that out. I will also try and take a pic of my seat height but I did have it higher and it didn't feel right, but that could be because of the bar drop. The current lenght always me to maintain an even stroke even when I am tired. My way of confirming saddle height is by riding up a hill. I start with it high and lower it until my thighs hurt (substantially more) on the hill, which is a sign that it is too low. 56cm? ?....how tall are you Sam? I'm 5'10" and the bike I'm pictured on is a 53.....with a sloping top tube. Are these boutique racing bike brands, sold by 20 year olds with nine inch hips? I invite you to waste a days holiday and go to Spa in Harrogate and ride some of the test bikes....take your shoes and pedals. 531colin wrote: 56cm? ?....how tall are you Sam? I suspect that your 53 is a true frame size whereas the 56 is a virtual frame size. The head tube dimension looks about right for that. I ride a true 56 frame (22") with horizontal top tube. I am 5' 9" with 32" inside leg trousers. Funny that - one of the old "quick estimates" for frame size was 10" from your inside leg - works in my case but maybe not everybody's. I am 5 11 with a pbh of around 90cm. The boutique bike shop was Mosquito bikes, which have a lot of high end steel. I suspect I should be on a 58 rather than a 56. I'm 5' 10".....stuff an LP cover up my crotch and mark the wall test gives about 86cm. Its a slightly unusual bike, its a roughstuff bike, the seat angle is very slack so it isn't as long as the numbers suggest, and the head tube is higher than the numbers suggest because I can get a 700x40 tyre in with mudguards and clearance. Given the numbers you should have 4cm more seatpost exposed than I have....it looks like more than that, and certainly at least a bike size more.